If you have a need for Xtreme lighting then this page has what you need! Our NEW line of Brite Lites Xtreme Off-Road lighting is the top of the market, with long LED light bars in single and double rows of LEDs, as well as post mounted LED and HID Rally lights to shine a mile down the trail. Take a look and see what you've been missing! We are adding new parts weekly as this market is growing fast. Super unique, super quality! ALL NEW Design! 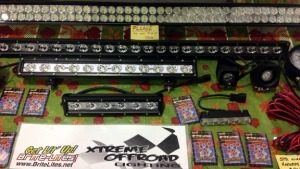 Xtreme Off-Road Brite Lites Single Row LED Light Bars are a super slim light bar with powerful 5 watt CREE LEDs to make the light bar as bright as possible. Our heavy duty end mount leg system is fully adjustable and reversible! In 7 lengths from 8" to 48". All are packaged with a quick connect input cable to match our wiring harness options. Wiring harnesses are sold separately. 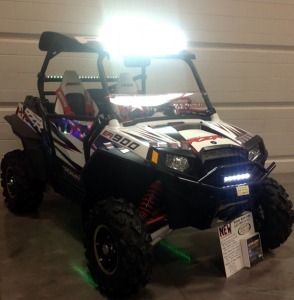 Xtreme Off-Road Brite Lites Double Row LED light Bars are the brightest way to add light on your vehicle! The double row design makes for intense light and available in lengths from 8" to 43" long. 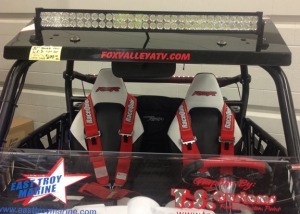 This UTV has the 32" Double Row (BL-LBD32) on the roof and is our most popular double row unit by far! 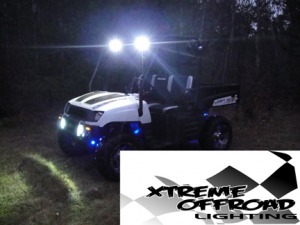 The Xtreme Off-Road Brite Lites post mount spot and flood lamps are available for any 12 volt application. We offer a full line of post mount lights from mini LED spots up to a 7" round HID Rally light that shines almost a mile! Work light Flood beams and Pencil Spots for any need. A flood beam will give a wide field of vision and is great for slower moving vehicles. A pencil spot is a focused narrow beam for faster moving vehicles and you need to see as far forward as possible.